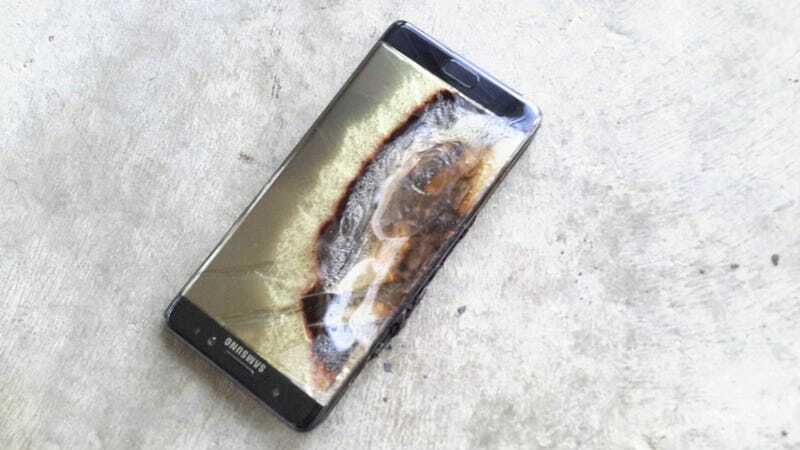 Yet another Samsung Galaxy Note 7 has spontaneously exploded, this time reportedly racking up more than $1,800 AUD ($1,383 USD) worth of damages in a man’s hotel room. The owner of the latest exploding Galaxy Note 7 is an Australian man who says he was on business trip when his hotel room almost went up in flames. He posted the entire saga on Reddit, under the alias Crushader. If true, the saga is downright scary for all parties involved. This is just the latest in a string of unfortunate events for Samsung’s Galaxy Note 7 release. Last week, Samsung announced a global recall following several reports that the phone was overheating and exploding. Samsung also vowed to take care of the people who’d already bought a Note 7 smartphone. The company promised to “voluntarily replace their current device with a new one over the coming weeks.” Apparently Redditor Crushader did not receive the memo. “It fizzed and then phone pop open, flame and smoke follow, almost had a panic attack sight to see waking up,” he said on Reddit. The recall has been a major setback for Samsung. The company’s mobile profit was on track to post annual growth for the first time in three years, largely because of the success of the Galaxy S7 phone. The Note 7 was expected to keep sales going at a strong pace. With Apple expected to unveil the iPhone 7 next week, the timing couldn’t be worse for Samsung.